Orbital ATK, Inc. (NYSE:OA) , a global leader in aerospace and defense technologies, today announced that the SKY MEXICO-1 (SKYM-1) satellite, built by the company for DIRECTV, was successfully delivered to orbit aboard an Ariane 5 rocket and is operating as planned early in its mission. 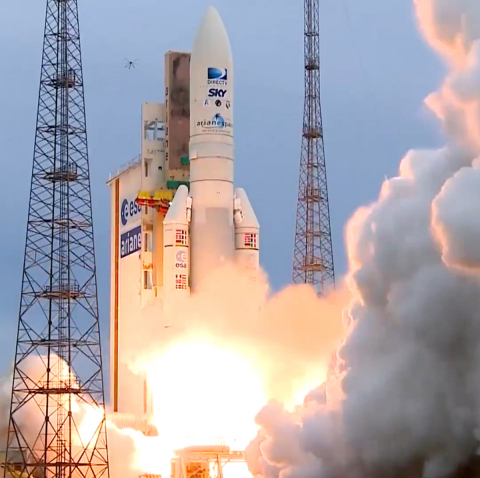 The lift-off of the Ariane rocket occurred today as planned at 5:15 p.m. (EDT) from the launch site in Kourou, French Guiana. The satellite successfully separated from the launcher approximately 38 minutes into the mission, placing it into its targeted geosynchronous transfer orbit. Orbital ATK engineers have completed the initial post-launch health check and the configuration of the satellite in preparation for several weeks of orbit-raising activities and in-orbit tests, after which the spacecraft will be placed in its final orbital slot. The in-orbit testing will ensure that all satellite subsystems are functioning properly before SKYM-1 is officially turned over to DIRECTV for full operational control. The SKYM-1 satellite is based on Orbital ATK’s flight-proven GEOStar-2TM platform and will provide direct-to-home television broadcast services to Mexico, Central America and the Caribbean for DIRECTV. Orbital ATK produced the satellite in just 20 months and delivered it to the launch site four months ahead of the original baseline schedule. Built and manufactured at its state-of-the-art facility in Dulles, Virginia, SKYM-1 is equipped with 24 active Ku-band transponders and two active R-band transponders to provide DIRECTV’s premium video broadcast services to millions of users. The commercial communications satellite uses reflectors, solar arrays and structural components produced by Orbital ATK’s Space Components Division in California and Utah. At launch, the spacecraft weighed 2,962 kg (6,530 pounds) and carried sufficient fuel on board to provide an anticipated 20-year mission life. The SKYM-1 satellite is the 35th GEOStar spacecraft launched for customers around the world. Orbital ATK is currently producing the following satellites that will be delivered and launched for customers over the next several years: Thaicom-8, Al Yah 3, HYLAS 4 and SES-16/GovSat.